This nicely renovated apartment is brand new to the market. It is bright and quiet, faces west and overlooks the gardens below. The kitchen which is partially opened to the living room has full size appliances and granite countertops. The bathroom with the original tiles and tub is in excellent shape. The apartment features oak strip floors, beamed ceilings and pre-war detail throughout. This studio will make the perfect first apartment. 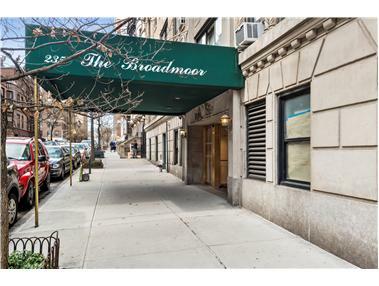 The Broadmoor is a full service building with a 24hr concierge, doormen, a live-in super, and maintenance personnel. There is a central laundry room in the basement. Other features include a spectacular glass enclosed solarium with WiFi and an outdoor, finished roof deck with gorgeous Hudson River views. The sale of this apartment is subject to Board approval. The Board allows purchasers to finance up to 80% of the purchase price.